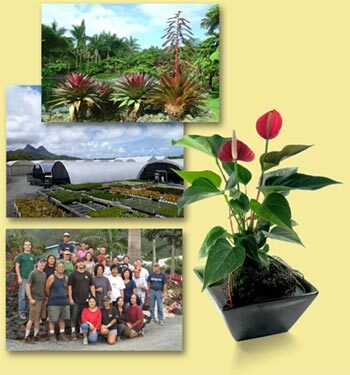 Hawaiian Sunshine Nursery, Inc. is a family owned and operated nursery specializing in bromeliads and other tropical plants. Our original nursery was established on the Island of Oahu in 1978. Since then we have added additional nurseries on the Big Island and we currently have over 25 acres under cultivation. We cultivate and care for over 100 varieties of tropical plants ranging from anthuriums to xanthosoma, producing more than 400,000 individual plants each year. Our dedicated staff of growers and horticulturists provide the individual attention needed to ensure that each plant we sell is healthy and of the best quality. As part of our commitment to quality, Hawaiian Sunshine Nursery is constantly improving its facilities and researching better propagation and cultivation methods. For a visual tour of our nurseries, visit our article on A Tour of our Facilities.